But biologists predicted the additional protections will have minimal impact on Maine because, unlike endangered piping plovers that breed on state beaches, the red knot is only a transient visitor. “We all pitch in to support endangered species conservation, but Maine may have a more limited role on this one” than other states, said Charlie Todd, endangered-species biologist with the Maine Department of Inland Fisheries and Wildlife. Tuesday’s announcement applies to the “rufa subspecies” of red knots that appear in roughly 40 states and undertake one of the longest migrations in the animal world – as far as 9,300 miles each way. While New Jersey and Delaware see the largest concentrations of migrating red knots, hundreds of the shorebirds feed on Maine beaches for a few weeks at a time from summer through fall and then again in the spring. Red knot populations have fallen by as much as 75 percent in key parts of their range since the 1980s, according to federal officials. The biggest hit came around 2000 when overharvest of horseshoe crabs – whose unique blood is used in medical applications – in the Delaware Bay wiped out the crab eggs that the birds depend upon to fatten up before continuing to the arctic or South America. 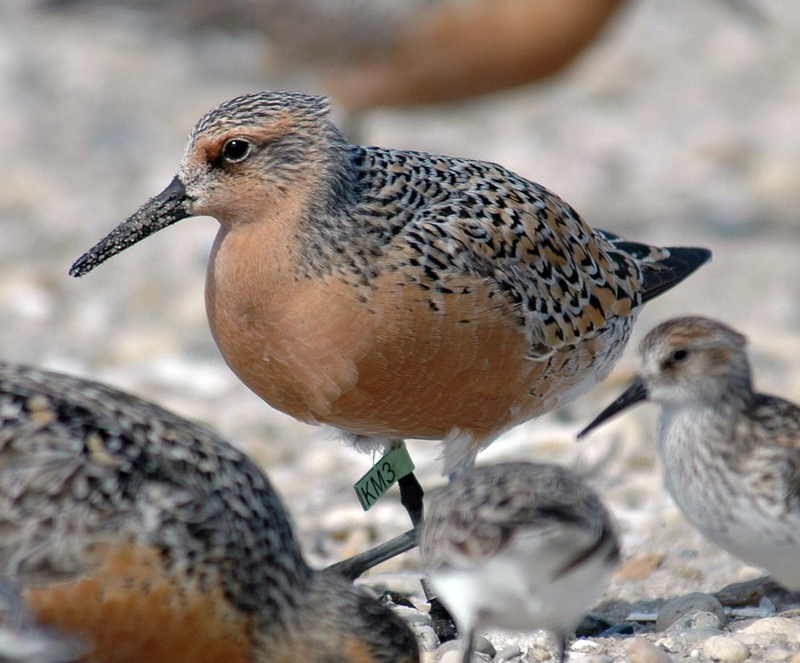 Studies of Delaware Bay red knots have shown that some birds double in weight before beginning the final leg of their journey. But the birds also face serious threats from habitat loss and hunting in South America as well as from climate change, which affects the birds’ habitat and food supply. Maine is host to roughly 30 species of shorebirds, including several protected under the Endangered Species Act, and many of the areas where red knots feed are already protected by conservation agreements or under Maine policies protecting “significant wildlife habitat,” said Lindsay Tudor, a shorebird biologist with the Maine Department of Inland Fisheries and Wildlife. Southern New Jersey’s seasonal population of red knots fell from 100,000 to roughly 25,000, prompting the state to list the birds as an “endangered” species in 2012. Additionally, the Atlantic States Marine Fisheries Commission has enacted stricter limits on horseshoe crab harvesting and blood collection in order to protect both the crabs and red knots, a step that scientists say is helping to stabilize populations of both species. Eric Stiles, president of New Jersey Audubon, told The Associated Press that because New Jersey has already listed the bird as endangered, conservation efforts likely won’t change drastically in the state. The main advantage of the federal listing, he said, is cross-state coordination on protecting the birds’ critically important migratory stopovers. “Imagine if you are driving across the country and there are only two or three pit stops to fuel up and get food and if you don’t, it’s all or nothing. Either you make it or you don’t,” Stiles said.